The C7Grand library is based on a Yamaha C7 Grand piano. The C7 is the biggest of the C series (227cm / 7'6") and is one of the most used pianos as it is present on many concert stages, studios and prestigious music events. We wanted to capture its delicate, bright and precise sound that you hear everywhere, so we used every technology and piano simulation tools that we worked on over the years and here it is, the C7 Grand with all of the features you can think of, multiple microphones (3 different stereo perspectives), half pedal, repedal, sympathetic resonances and many other that we will detail below. It is also very customizable as we know that not everybody has the same digital piano or has the same taste, you can change every aspect of it, the overall sound, the tuning (even complex microtuning are possible) or the MIDI response. The C7 Grand is using the popular flac lossless compression format (UVI Workstation 2.5.2 is required to use it) to increase the streaming performances and loading time without losing any audio quality. You also save space, the library goes from 14Gb uncompressed to 2.41Gb. The C7Grand has been sampled with 3 pairs of microphones carefully phase aligned. You can load, enable and control the volume of each of them. The Close microphone perspective is placed inside the piano very close to the strings and gives powerful bass and a very detailed sound and a wide stereo image. The Player microphone perspective is placed above the head of the piano player. The stereo image is almost like the one you get when you play, the sound is brighter and has more air than the close position. The Side microphone perspective is placed exactly where a solo singer would be standing. It has even more air than the other two perspectives. You can of course mix the multiple positions to get the best of each position. The C7 Grand has two very advanced types of resonances simulations. The first one is the sympathetic resonance that notes are creating with eachother when the sustain pedal is up. Every note will interact with all of the other pressed notes and make them resonate. We modeled the behavior of the strings but based all of that work on samples of the real resonances. You can adjust how much of it you want and also how much polyphony you want to allow for this feature. The second one is also the sympathetic resonances, but this time when the sustain pedal is down, we call it the true pedal action, it simply allows the resonances to come in even if the pedal is pressed after you press the chord, and even if you release the pedal and press it again while still holding a chord. The C7 Grand features some advanced pedal features. Repedal : Many classical musicians use repedaling to give some kind of a blend effect. We felt that it should be part of this library. Just like on a real piano, this effect is more present in the bass area. Sostenuto : This is a playing mode that will allow the player to choose which dampers will be held. Any note pressed before pressing the sostenuto pedal will be held until you release the pedal no matter what you play. Half pedal : This is another playing mode that is used to create a blending effect between chords. It is simply setting the sustain pedal right at the spot where the dampers barely touch the strings thus creating a long release sound full of resonance. You can assign the different pedal to any controller. On this panel you have access to many different settings to shape the sound of the piano itself and how it reacts. This is also where you enable and disable the advanced features like the repedal, half pedal or the sympathetic resonance. It is also where the reverbs can be tweaked. The Repedal enabled the repedal feature. It allow the sustain pedal to "retrigger" the notes that did not die since the last pedal release event. The Half Pedal enabled the half pedal effect. This allow the use to trigger different release samples when the pedal is half pressed (you need a continuous sustain pedal for it to work). The Reverb gives you a choice of quality IR based reverbs, as well as the amount of Reverb you want including the dry/wet balance. The C7Grand has been sampled deeply and we used advanced filters to blend the velocities together and make the splits unnoticeable. There is also a complete set of tools to tweak the velocity and volume response to make sure it fits your digital piano and your playing style. The Round Robin enables the round robin script that will alternatively take the notes next to it and pitch them to get rid of the machine gun effect. Dynamics controls the dynamics of the piano. In other works it defines the volume corresponding to the lowest velocity. When set at 100, the volume at the lowest velocity will be 0 and when set at 0, the volume at the lowest velocity will be the same as the volume at the highest velocity. The tuning panel allows you to completely tune the piano. You can tune each note separately or use the Tuning Mode to choose if you want to apply this to every note or to every octave only. This makes it very easy to apply microtuning tables for example. 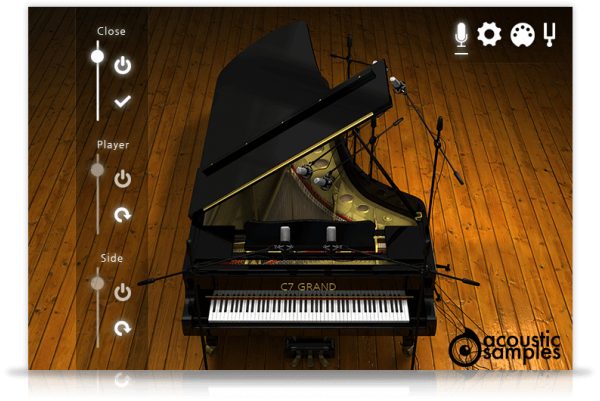 C7 Grand comes with its own sample player, the UVI Workstation 3 (requires v3.0.0 or later). 15Gb uncompressed, 2,41Gb compressed in lossless flac format, around 4800 samples. 3 microphone positions that you can load, enable and mix. Large choice of high quality IR based reverbs. Advanced tuning (each note can be tuned individually and microtunings can be applied). True pedal action (real bahavior of the pedal down resonances). Complete control over the MIDI response of the library. I don't know how you guys approached the sampling and velocity layers (since you don't state how many) but i can tell you that your C7 is the best i played and the closest to the real thing. I went on a hunt and bought every major piano vst on the market. I own Garritan CFX, Ravenscroft, Ivory II American Grand, Keyscape and several others. After weeks of playing/testing/bouncing/listening, i came to the conclusion that your C7 is the one i will be using for my solo piano album. I love the variety in character i get from trying different mic perspectives and mixing them together. It clearly shows that you guys did not cut any corners with recording those different perspectives. My only comment is that the volume and velocity are too harsh right out of the box therefore i find myself always lowering the volume of the mics and ramping the velocity curve . But that's okay i guess hence i can save my setting as presets. I love it... it sounds big and full and clear; but I knock off two full stars for not having soft pedal samples!!! That is so important to the performance of piano as an instrument and it's a huge oversight, IMO. purchased this on the AudioDeluxe flash deal and I'm loving it. Very playable, very responsive, tweakable to your hearts content. Another great product from Acoustic Samples! Heartily recommended, although I did only purchase because of the deal, purely because I already own so many piano plug ins. This superb virtual piano deserves some serious praise. Having played and/or owned too many software & hardware pianos to mention, as well as 37 years playing every acoustic piano brand and type imaginable (including a recent stint working for the Australian Steinway agents), Acousticsamples C7 is in my opinion the finest virtual piano available, alongside the VI Labs Ravenscroft 275. They have somehow managed to not only create a totally realistic tone, but also create an instrument you can CONNECT with and be inspired with as a player, something which lacks in many other virtual pianos. Stellar tone, voicing and consistency across the range - a lot of care has gone into this instrument. Thankyou to all involved in making this available. The quality/price ratio is outstanding.